Maes-y-Delyn: When an animal escapes... check the power is running to the fences 1st! When an animal escapes... check the power is running to the fences 1st! Well I got up Friday morning to find a suspicious creature roaming around the cows in their paddock... On further inspection I realised it was the lovely Sage! So when I went down for their morning feed, I turned off the fence and marched down the garden, shaking the bucket loudly; not something I would do normally, as it winds them up- but that was my intention, I found out. Up she ran, stopping at the corner of the paddock, pondering her options. At first I thought she might head for the house garden, as the barb isn't as low and there's no electric fence. 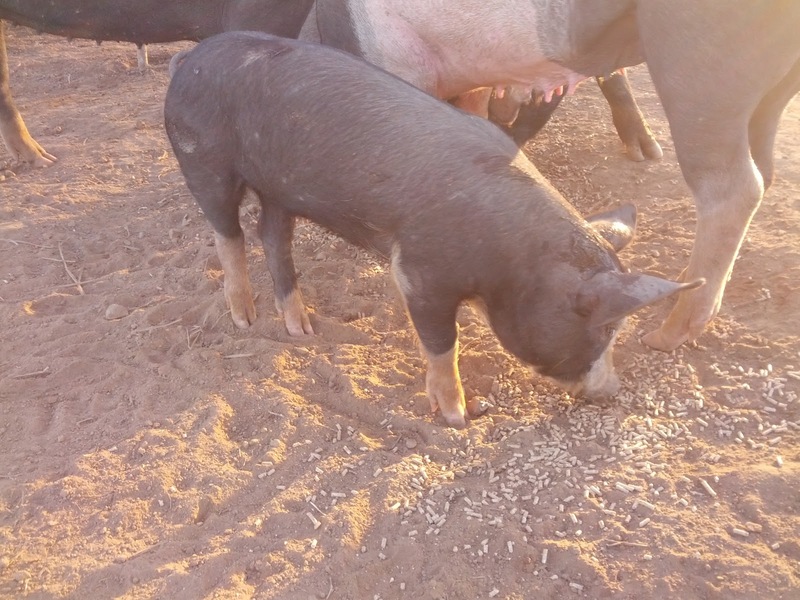 But she went for the pig pen fence; burrowing underneath, lifting the barb wire and (something I had never seen a pig do), pull herself along with her hind legs straight behind her (like a dog). Fortunately none of the others had ventured over with her, though this maybe why- as I have never seen any of the others do this. And the bore and other sow are probably that little bit too big- but am grateful Berky (our grower) hadn't, as he is much smaller still. 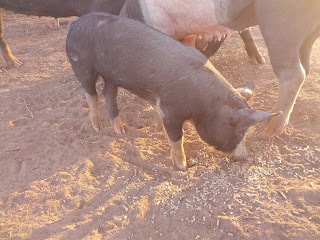 Knowing there was little I could do before work, I left- hoping I still had all our pigs when I got back. So on my drive home, I came to the corner, holding my breath as I counted 1, 2, 3 ??? Then I realised the cows were in their field, with an extra! So when Matt got home, we set about solving this problem. Explaining how she had returned, twice. We agreed tightening the barb and lowering the fence lines would be most effective. Sage thought otherwise. 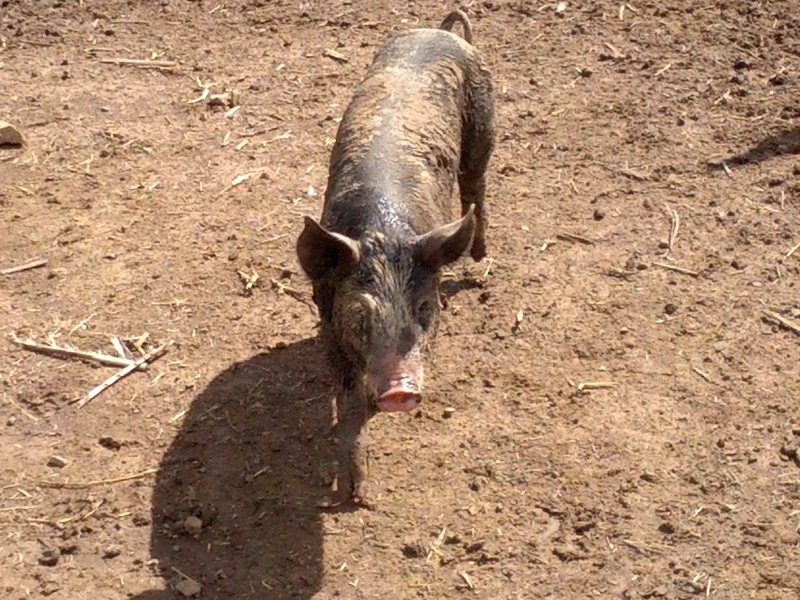 On both Saturday and Sunday we found her happily roaming around the paddock with the cows. 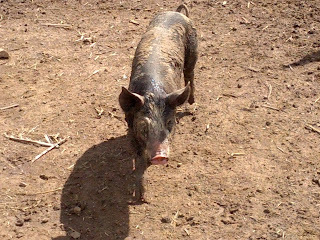 To be honest if I could leave her roam the whole paddock I would, but it isn't secured for a pig. And the cows share other peoples paddocks,(as not all of them are ours- they're a sort of "community herd". Though at present it is just ours and our adjoining neighbour. I still don't think his neighbours would be best pleased if she ventured onwards. So we added wire fencing to her 2 favourite spots, as a visual deterrent (as well as making it physically harder), as well as an added obstacle of another line electric fence, before the main area- where she was burrowing. As we were doing this, we added another (lower) line to the temporary fenced off section; the bit that is in recovery, so they have pasture of their own to graze on. As our Berkshire cross had ventured over Sunday morning, grazing on the seedlings and shoots that had begun to come! It was then that we questioned whether all the fence wires were "live?"... They weren't. The lower wire running along the fence line to the garden was. But the second run was a return wire and it wasn't reaching the pig pen. After about an hour of Matt carrying out the "leaf test"; which involves wetting a leaf and using it to make contact with the wire; so you are not taking the full belt of the fencing! We realised that a knot along the front fence had burned out. Given that we had tested it about a week ago, we figured the rain may have helped this. So with a little maintenance and a metal joiner, our fence was fully operational once more! So far we have had four pigs in the pen and in their section... so hopefully I can go to work now, knowing they are safe and sound.